Ryan is looking forward to spending the summer with his old school friends at Katie’s luxurious Spanish villa. He hasn’t seen the gang since their friend, Janey, committed suicide a year ago. He hopes this summer they’ll be able to put the past behind them and move on – until someone else arrives, claiming to have proof that Janey’s suicide was murder! Ryan was hoping for sun, sea and sand. Suddenly, he’s facing a long, hot summer of death, drama and deceit. I really enjoyed James Dawson’s first novel, Hollow Pike, a supernatural mystery set around a school in a northern town with a history of witchcraft; the teenage characters felt rounded and believable with, for once, a realistic range of teenage ‘types’ being represented, including gay teens, nerds and outcasts, not just blondes with swishy hair or musclebound sports players. It’s a shame more YA school-based novels don’t reflect the real diversity of teenage life, but luckily for us, Dawson has done it again in Cruel Summer. I’m so pleased I preordered my copy because it meant I earned a lovely personalised bookplate from the author himself! When I was a teenager myself, I spent on particular summer burning my way through a huge number of Point Horror books, which I discovered at the secondhand book stall in Norwich Market. I still have a collection of over twenty of these fantastic spine-chillers on a shelf at my parents’ house and I must reclaim them again, because Cruel Summer has completely whetted my appetite for tightly plotted, witty and sharp teen murder thrillers once more. I had a great time sharing this rollercoaster ride with Ryan, a very funny and sympathetic narrator. He felt completely real and rounded; he’s gay – still bizarrely unusual for YA books – but this is just a part of who he is, rather than inserted to bring an ‘issue’ to the fore. I loved his habit of thinking of his life as a primetime drama, with himself in the lead role, surrounded by a cast of character who, while also feeling very real, also relate to the American high school and horror tropes – Greg the jock, Katie the good girl, Ben the nice boy, Alisha the party girl… And, it’s not just the readers who are aware of this; the characters recognise their situation and this adds to the tension, as Ryan becomes more and more concerned that one of his best friends may have murdered Janey. The thrills, and the horror, mount slowly but surely as the plot progresses. Dawson smoothly adds flashbacks and memories from the friends’ past, linked into the present-day action clearly and logically – they never fall into the trap of an infodump and always add an extra note of doubt or thrill into the story as one of the cast is shown in a new, suspicious, light. They certainly all have secrets to hide. I think I suspected each and every character at some point, other than Ryan himself who just seemed too sweet and concerned about Janey to be guilty. That being said, when things start to get serious after wildcard Roxanne comes to visit and stir up trouble, we see just how ruthless Ryan can be. Dawson seems to have a real feel for older teen characters, and writing for an mid-to-late teen audience. The action is fast-paced and dangerous, the characters smart and streetwise, and there’s a definite frisson of sexual tension in the air. However, the choice of language is not too strong for a mid-evening audience (Ryan censoring it for us, although I’m sure most people get the idea) – it’s a great way to keep the balance between grown-up and a little too adult for some. Also, I know some people who think if you have to swear to get your point across, you need a wider vocabulary! Not only that but he’s created a fantastic murder mystery. 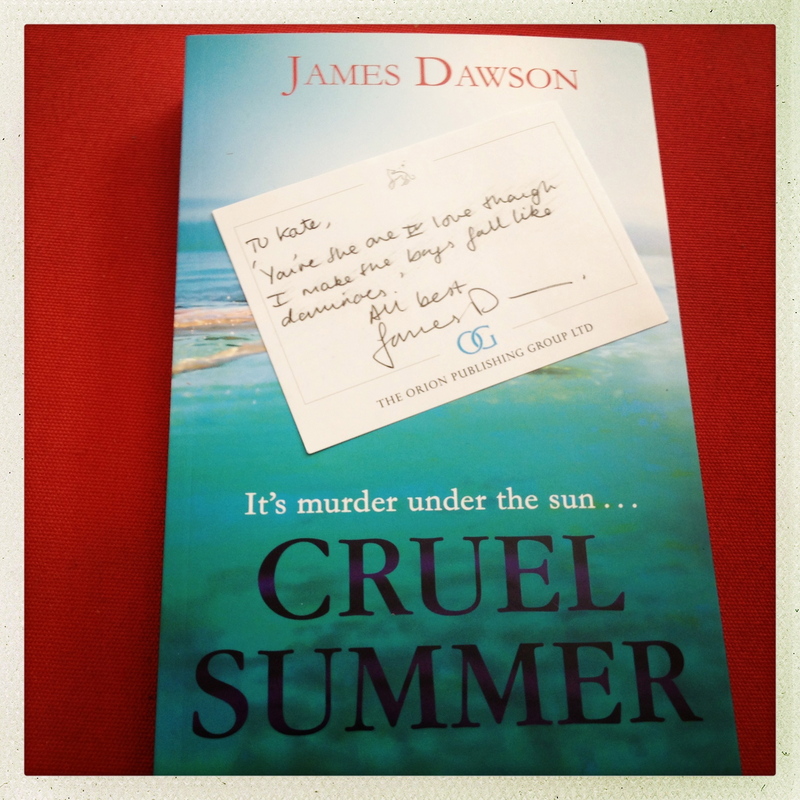 Could James Dawson be the Joss Whedon of teen fiction? It’s probably too early to say but I’ll happily keep reading to find out.